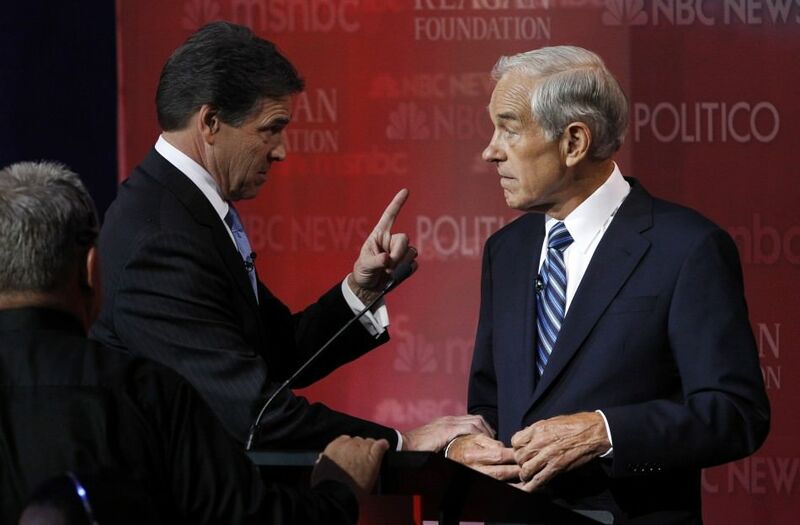 If you watched Monday’s the CNN/Tea Party debate, you could be forgiven for asking what the septuagenarian Texas congressman Ron Paul has against his home state governor, Rick Perry. It’s pretty simple, actually. Paul is channeling the same grievances that tea partiers in Texas have attacked Perry with for years. Specifically, that his executive order mandating the Gardasil HPV vaccine for adolescent girls was an invasive power grab by big government; that he increased spending over his decade as governor; that he’s raised the state’s level of debt; and that he’s raised taxes (Paul says he’s experienced this firsthand). Hungry for more debate coverage? Check out Andy Kroll on Rick Perry’s Wall Street comments and the crowd cheering a man’s death, Asawin Suebsaeng on Jon Huntsman’s new strategy, or Tim Murphy on Rick Perry’s sale price and Herman Cain’s Chilean model. If this sounds familiar, it’s because this is the same line of attack that was launched against Perry in 2010 by Debra Medina, the nurse and former county GOP chair who finished a surprising third in the Texas gubernatorial primary. (I previewed this line of attack back in August.) There’s more there that Paul likely believes but neglected to mention (the much-maligned Trans-Texas Corridor, which he and others viewed as a harbinger for a future North American Union, for instance.) And it’s not the first time; if anything, it was just a more substantive reprise of the back-and-forth between Perry and Paul at last week‘s debate, which culminated in this photo. Paul won’t win the Republican nomination. But Romney might, and if he does, he’ll have Paul to thank (at least in part). That’s because Paul is able to make the case that Perry is really just a Big Government wolf in sheep’s clothing with a level of credibility that pretty much no one else has. Tea partiers, which is to say the conservative base, don’t really gravitate naturally toward Romney. Paul’s attacks make the gap between him and Perry seem that much smaller.